Faced with damaged DVD or Blu-ray disc, how do you handle? Give children to play as toys? No!No!No!, this is too dangerous, easy to hurt them. Directly throw? But we always feel pity, psychological obsession the movie inside. DVD / Blu-ray as storage device, their convenience and safety are no better than hard drive. Therefore, Faced with the above situation, which we can not prevent, but we can copy DVD / Blu-ray disc movie to our hard drive before they damaged, it will be more convenient and secure. Security, we might have more recognition, we may have doubts about the convenient. In fact, when movies is on our hard drive, we can play then on our computer directly or on a Mac to Play movie directly , without third-party software. We also can stream video files to STB ( set top box ) and then watch them on the big screen TV or projector , and even we can send video files to be played on various handheld devices ,which is no way to directly play DVD / blu-ray. So that we can enjoy classic movies anytime, anywhere, feel an different home theater. Do you fell a lot of convenience? At present, many of the movies have adopted multi-track or in the form of subtitles, so we hope that the conversion can be kept out of the movie but also with multiple audio tracks subtitles. Maybe you had used Handbrake to deal with multi-track audio and subtitle, but its effect is not good, and it doesn’t have lossless option. If you are Mac user, here we recommended Pavtube ByteCopy for Mac, it not only can convert DVD/Blu-ray to hard drive preserving multi-track audio and subtitles, you can choose which audio track and subtitle you want, and get rid of those you don’t need, besides retaining multiple audio tracks and multiple subtitles in an MKV video without transcoding and quality loss, the quality of the video and audio is very good. Windows version is Pavtube ByteCopy. 1. Click the “Load Disc” button to load your source BD/DVD disc from disc drive, or import BD/DVD ISO image, BD/DVD folder, and DVD IFO from Mac hard drive to Pavtube ByteCopy for Mac. 2. Choose “Lossless/encoded Multi-track MKV(*.mkv)” from “Format” drop-down list as output format. 3. Enter “Settings” option to adjust profile presets (optional). 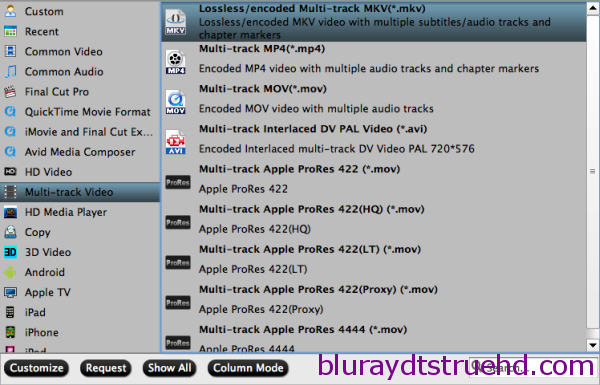 Remove unwanted audio tracks and subtitles from saved MKV file. 4. Hit the “Convert” button. Now you can not only copy your original Disney BD/DVD to MKV without quality loss, but also get almost same video quality from original BD/DVD to saved MKV files besides all or multiple audio tracks, subtitles, and chapter markers can be preserved.